If given a choice, are you more likely to turn left or right? Mesa Community College alumna Rosaline Dye’s interest in the subject resulted in the publication of her research in a scientific journal. The research, “Absence of Lateral Navigation Bias in Young Children” appears in a 2014 edition of the journal Perceptual & Motor Skills Physical Development & Measurement, volume 119. 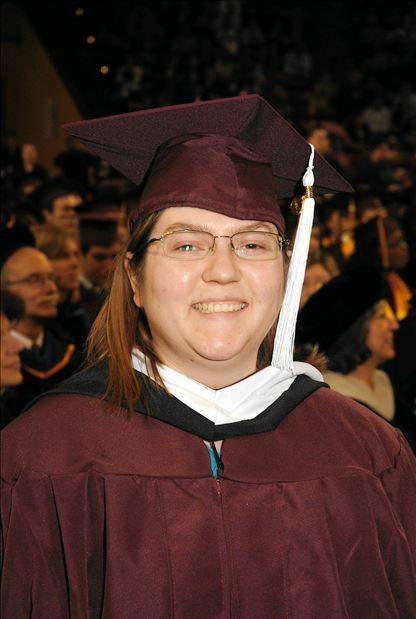 Dye, who attended MCC from August of 2005 to May of 2007, graduated with two associate degrees from MCC and was member of Psi Beta and Phi Theta Kappa. After completing a Bachelor of Arts degree in psychology at Arizona State University, she went on to earn a master’s degree in cognitive science. We asked Dye to share with us some insight into her research and her memories of attending MCC. Question: How did you become interested in this research topic? Answer: I had read an article that compared British and Americans on a similar task as mine and found that British people were less likely to go right than Americans. This got me thinking about the origin of the rightward navigational bias. I did a lot of research and found that there were quite a few papers on the subject, mainly in two camps, biological sources and social sources. Things like driving side of the road and reading directions were shown to have an effect on how strong the rightward bias was for participants. How would you eliminate reading directions and driving side from a population? The answer came as children. Using previous research as a basis, we designed a simple navigational task for young children and put it to the test. We found that there was no such rightward navigational bias in our children participants. The next question then became: if the bias isn't present in very young children, when does the bias start to emerge? We then tested older children on a scaled up version of the task we had the young children do and found that they also showed no real bias. We also tested adults on the same, but scaled up test in the beginning to make sure that our task was valid, and it was, as it showed the rightward navigational bias that previous research had shown. Q: What was your goal for the research? A: My goal for the research was to try to establish when the rightward navigational bias started. We did not have enough time to go through each and every age group to establish a true timeline, but we figured out that it, at the very least, is not present in children younger than 8-9. Having published the research, I also attained the goal of sharing these results with the research community and with the general public. Q: Why did you choose to begin your education at MCC? A: I chose MCC to attend mainly because of location and finances. I ended up getting the President's Scholar tuition scholarship while attending, which greatly eased the burden of attending an institute of higher learning. I also liked how small the class sizes were compared to ASU. Q: Share with us a memory of MCC. A: I have many positive memories at MCC, so it's hard to pinpoint just one. I found my passion for statistics at MCC thanks to Dr. Borman in the psychological sciences department. The way he made the lab portion of the course fun really opened my eyes to the idea that statistics can be fun and akin to solving a mystery. I also have many fond memories of my conversations with Dr. St. Peter. She was my mentor while I was attending. She encouraged me to get involved in the community and helped guide me to set myself up for graduate school while I was attending both MCC and ASU. I enjoyed my time at MCC because of the ability to interact with faculty and get involved in organizations like Psi Beta. I don't believe that if I had attended a larger institution that I would have been able to get the same quality of interaction and mentoring that I received at MCC. Q: Would you recommend MCC to others? A: Of course I would recommend MCC. The class sizes are fantastic, the faculty is knowledgeable, the community is great and you can't beat the price for tuition. A: Currently I am working on writing up my thesis. For this specific project, future work would include increasing the ages of participants to get a more concrete timeline of when the bias starts to occur. I am also looking to become a community college professor, as my time at MCC inspired me to give back to future students the way that I have been mentored and guided.